The question has come up a number of times in class as to what constitutes a shadow and at what stage of the drawing should one differentiate between differing values of shadow. The most important principle to remember is that shadow is where light from the single direct light source doesn’t reach. So, if the light is coming from top left, it stands to reason that everything facing away from that light source does not receive direct light, and therefore it’s in shadow. In this example, where light is from top left, all planes facing to the right and facing down, will be in shadow. Inside the shadows there may be some light bouncing back off a prop or another part of the body, back into the shadows. That is called reflected light and is part of the family of the shadows. 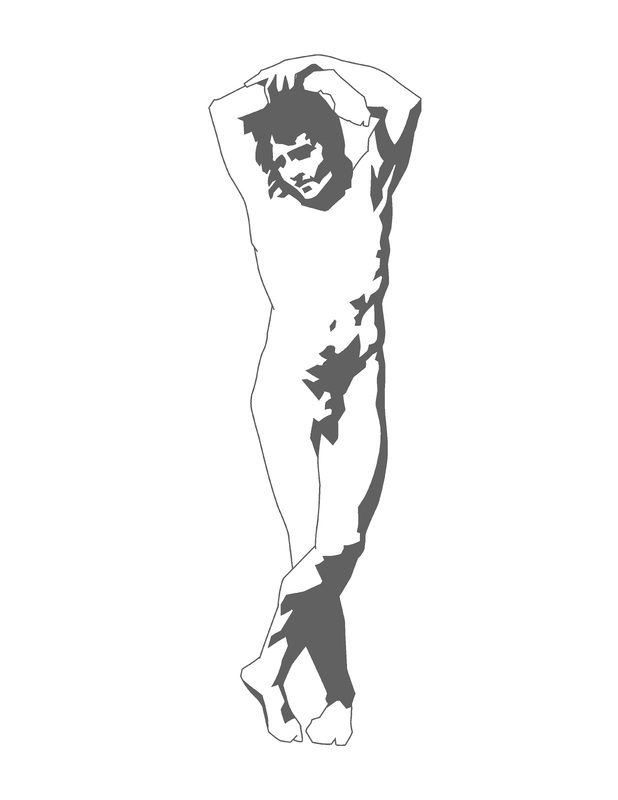 Derek has kindly done a tracing for us of all the shadows in this Prud’hon figure and filled it in with a value #5. This is the stage that every drawing should get to, before proceeding to the rendering of the lights and the variations of the darks. The shadow shapes, and the light shapes are well articulated, and there is now a foil of grey for all the shadows and a base of white paper for all the lights. There is no differentiation between lighter and darker shadows, bed-bug line, cast shadows, reflected lights etc. All the shadows are value #5. As for the lights, all previous marks, such as construction lines, centre lines, quarter- and half-way measurements are erased. 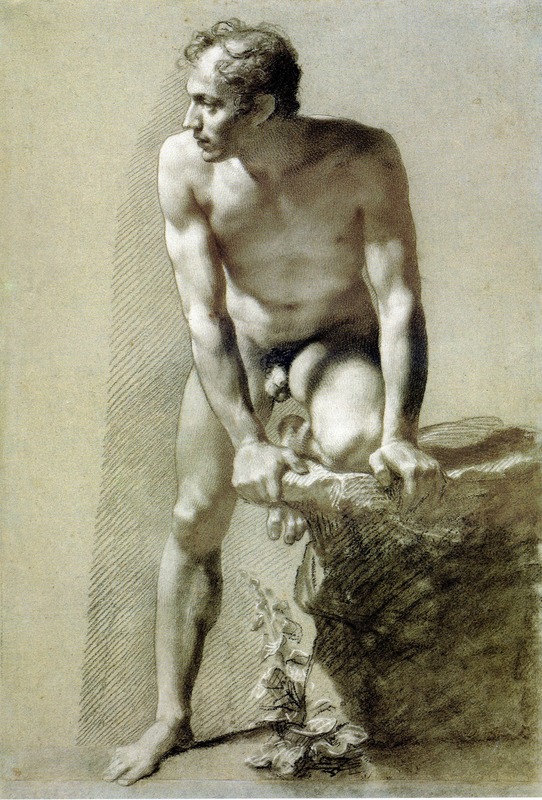 In reality, we are less likely to encounter a pose with so very much reflected light, and the following drawing, also from Prud’hon, is a more typical situation. One again, we have top-left lighting. Notice how all the shadows are facing away from that top-left. Especially noteworthy is the lower part of the leg on our right. It’s facing away from the light, but is getting a lot of reflected light. According to our light logic, therefore, it belongs to the shadows and is treated as such from the beginning. It’s worth noting, by contrast, the upper part of the leg on our left. This part of the leg is a place that is receding in space (slightly) towards a locked knee. It isn’t quite in shadow, but it is receiving much less light and is therefore part of the darker half-tones.